Was it as good for you as it was for me? I don't know, but here are my thoughts. What disappointed me a bit-I shall try not to spoil anything-was the twist the plot took halfway through the book. Don't get me wrong I still loved it once I got over the shock. It was just so, so....rerun?? I understand the whole reason Mrs. Collins went this direction, but to have everyone revisit the scenario that made book one so amazing spoiled things for me a little. This takes me back to what used to be one of my favorite shows, Prison Break. It was so original and fresh, thoughtful and intriguing, witty, and funny. I was addicted. I loved the characters-except for Michael's perpetual scowl that was supposed to make him look ruff. Pftt! HA hahahahaha! Just made him look constipated all-the-time. So they're in prison, they break out of prison, they are on the run-this show was awesome- then, they end up in a different prison that they now have to break out of again-WTF!! This smacked of recycled plot that writers hoped would elicit the same emotions from the viewers it did the first time. Bleeeeck! *leans and pukes into the nearest receptacle* It was a huge let down. I couldn't watch the show anymore, the character ceased to mean anything to me. I was a Prison Break widow, my love was dead. 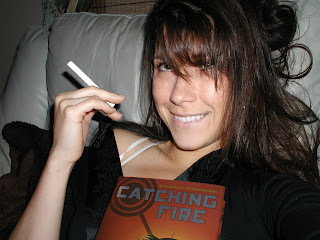 While Catching Fire went back to the premise for the first book, it still hooked me and I know why the author did it. It was vital for a televised revolt against the Capitol that could happen no other way. I can't wait for the next book. Suzanne Collins, I salute you. Well done. You left me with another cliffhanger, and I love cliff hangers. Is it September 2010 yet?? P.S. I don't smoke. It was a joke. HA ha!